RANGOON – They were the late-1990s peacemakers–Third Way buddy-cops whose ready smiles, demonstrative hand gestures and varnished empathy helped broker deals in places as different as Kosovo and Northern Ireland. 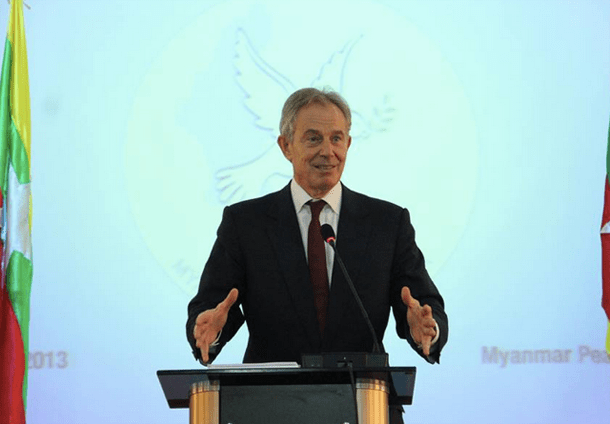 And as night follows day, on Friday Tony Blair trailed Bill Clinton to Rangoon’s Myanmar Peace Center, with the former British Prime Minister giving a similar speech to the ex-US President—only 22 hours later and to a slightly smaller crowd. Echoing the geographic content of Clinton’s Thursday talk, Blair’s Friday foray mentioned the Middle East, Northern Ireland and Nigeria. 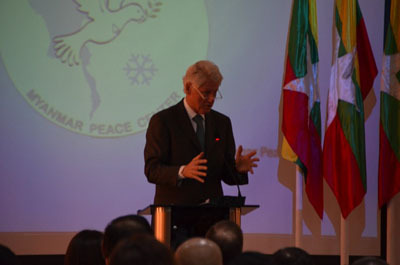 And as Clinton gave a touching first-person anecdote about reconciliation in post-genocide Rwanda, Blair recounted a meeting held right after the 1998 Omagh bombing, a terrorist act carried out by an Irish Republican Army (IRA) splinter group that ranks as the single deadliest atrocity of the thirty-year conflict in Northern Ireland. Blair and Clinton met for a while last night, and, said Blair, marveled at how it would have been unimaginable to both men, while they were in office, that they would in future cross paths in the former military-ruled Burma. It seems, however, that Blair might have slipped a copy of Clinton’s speech into his briefcase before the two men parted ways. “You don’t make peace with your friends, you make peace with your enemies,” Blair intoned, the versatile truism almost word-for-word a fragment of Clinton’s speech the day before. Like Clinton, Blair sought to allude to contemporary Burma by describing possible parallels elsewhere, but for the most part did not discuss Burma directly. But breaking with the tightly-controlled format of the Clinton event on Thursday, Blair fielded 10 questions—albeit queries pre-screened and pre-selected by the Myanmar Peace Centre. “How can a Burmese Muslim become a British?” the former British prime minister was asked, the question said to have come from a Muslim in strife-ridden Arakan State in Burma’s west, and read aloud by Kyaw Yin Hlaing, an advisor to Burma’s Government. “You have enough to do to get them into here,” Blair replied, somewhat bemused. “And that’s all I am going to say,” he quickly concluded. Blair has made three previous visits to Burma in past year, as his international political and business consultancy projects have expanded into countries as far-flung as Albania, Brazil, Kazakhstan and Vietnam. Blair made no mention, nor was he asked, of whether this visit is linked to his lucrative advisory and consultancy work.